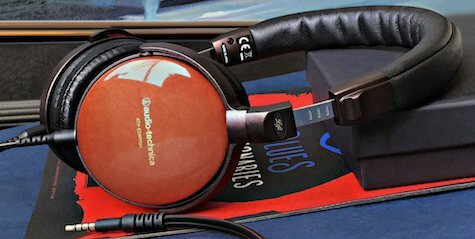 Review notes: My first impressions of the sound of the Audio-Technica ATH-ESW990H headphone (ESW990h hereafter) are based on direct comparisons to other headphones, particularly those that resemble its design (mid-size portable), but also to a few premium headphones for reference. I’ll describe how I relate to the ESW990h (i.e., my personal tastes and how I use the headphone) only after covering all of the objective issues. Starting right off with the ESW990h’s sound quality is a bass that needs no qualifiers. It’s warm-neutral, detailed, not a bit of mud or boom. Try “Katerine” by the Jim Ruiz Group or “Crying For No Reason” by Katy B, to get a sense of the typical bass impact and detail. It’s not quite equal to the better planar headphones, but I think most users will be amazed at what comes out of the very lightweight ESW990h. To best appreciate the midrange, listen to “Bailando Entre Espuma” by Israel ‘Cachao’ Lopez for its sharp-edged horn sounds, or “Trains” by Porcupine Tree for the sheer amount of percussive energy it contains. Many of the high-end headphones will sound a little too rough or edgy with these tracks, but the ESW990h sails through them without harshness or significant colorations. Treble response is where the ESW990h gets interesting. 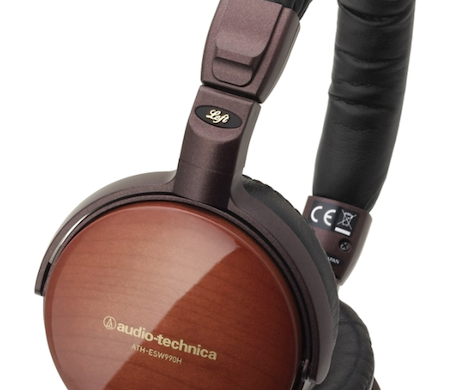 It’s very smooth as already evidenced by the music tracks just mentioned, but where many headphones, especially the smaller on-ear types, gain that smoothness by suppressing the highs, the ESW990h gets there through a combination of good acoustical tuning and the use of wood earcups that dampen unwanted resonances. Check out “Optical Illusion (Billy Buttons Mix)” by William Orbit or “Wicked Game” by Chris Isaak, two high treble energy recordings that can be ear-scorchers with certain audiophile headphones. The ESW990h plays these two tracks with silky smoothness. The obvious question then is “Just how good is the ESW990h sound or how much fidelity does it represent, without running into the strong sibilants and harshness that many of the flagship headphones produce with less-than-perfect recordings?” My answer: ESW990h’s treble is tuned for the maximum amount of detail that can be obtained shy of encountering the typical irritant factors heard with the brighter headphones. This by the way is not the “relaxed” treble that’s featured with the so-called “lifestyle” headphones, this is the real thing. 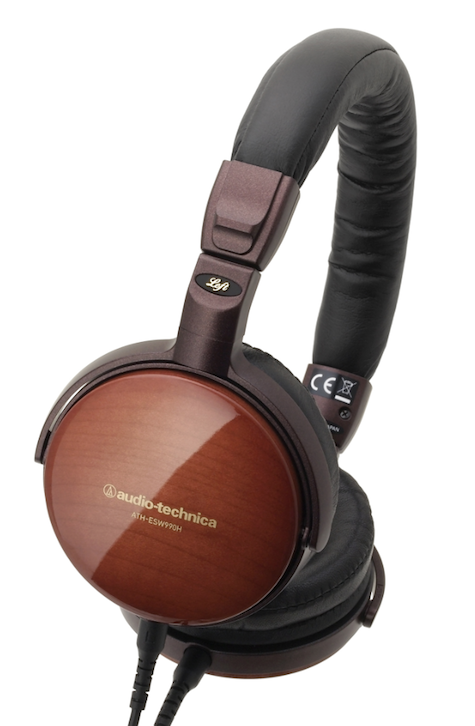 I’ve had several of the Audio-Technica ‘Earsuit’ wood-earcup headphones before this, and they have several things in common: Mellow, but good fidelity sound, deluxe soft-leather earpads, a soft headband, great-looking earcups, and a flexible fit plus light weight that’s ideal for portable use. Isolation is moderate — good enough for most outdoor use, but it won’t be the best bet for noisy commutes on a bus or a train. Leakage is low, but if sitting next to someone in a library or quiet office and playing music loudly, they will hear faintly some of the sound. The deluxe earpads are soft, and are beveled somewhat like the Audio-Technica ESW9a’s earpads, but where the ESW9a earpads felt a little stiff on my ears, the ESW990h earpads were immediately comfortable. The clamping pressure is light enough that experienced headphone users will love it. The earcup rotation is excellent — enough to fit any head, and the headband length adjustment of 1.35 inches is enough for nearly all heads, given that my average-size head fits right in the middle of that range. The ESW990h comes with a 1.2 meter (4 ft.) detachable cable, terminated on the music player end with a 3.5 mm smartphone plug, and terminated at each earcup with proprietary ‘A2DC’ connectors. The cable looks pretty sturdy to me — much better than the very thin cables supplied with certain famous-brand portable headphones. There’s a control box seven inches below the right-side earcup, which has a single button plus microphone. I was able to start and stop each track with the button, and move to next and previous tracks using double-clicks and triple-clicks, which seems to be the standard for single-button controls. In addition to the music tracks noted above, I’m including a few more examples below with comments about how the ESW990h sounds with each track, in case a reader wants to compare these comments to other reviews I’ve done to evaluate the differences. Sources: iPhone7+ with Oppo HA-2/AudioQuest DragonFly Black DAC/amps, various computers using the AudioQuest DragonFly v1.2/Lehmann Traveller DAC/amps. Beethoven Symphony 9, Solti/CSO (1972): Excellent overall sound. Of special note here are the bass impacts beginning around 10:30 of the fourth movement. Those impacts are soft and well in the background, but you can feel some of the weight they carry with the ESW990h. Chromatics – I’m On Fire (Synth-Pop, female lead): This track with the ESW990h has a good amount of space around the voice and instruments, making for a very pleasant stereo image. The voice is excellent, and the tambourine sound is clearly identifiable. Hans Zimmer – Dark Knight-Aggressive Expansion (Soundtrack): The percussion in this track hits really hard, and the bass tones beginning around 0:45 have some of the ultra-deep “shuddery” kind of sound and feel that indicates a useful deep-bass response. Overall, the ESW990h plays this music very well. Michael Tilson Thomas – Rhapsody In Blue (20th Century Classic): Great sound and soundstage, and terrific piano playing and tone. There are some very deep bass impacts starting around 38 seconds into the 17:24 length track, and the weight of those impacts is subtle with the ESW990h. Trombone Shorty – Backatown (Jazz-Funk): The deep bass impacts here are strong and work well with the horns and other instruments. The ESW990h delivers the impacts with very good weight and detail, and the horns have the kind of bite that gives them a wonderfully realistic sound. Our MyMac review rating is 9 out of 10.